We know one of your top priorities is paying less in taxes. This is best achieved through comprehensive tax planning. Whether you're an individual or operate a multi-tiered corporation or partnership, our tax strategists can accommodate your needs. Our tax planning and return preparation services provide you with a dedicated partner that will work with you year-round to develop a customized plan with tax-saving strategies that are tailored to your unique situation. Our personal, one-on-one service and expert advice will offer answers to your important tax-related questions in language you understand. We are diligent about remaining up-to-date on the changing tax laws, and will examine all of the tax-saving opportunities available to you. We are committed to minimizing your tax liabilities and maximizing your future opportunities—while remaining in full compliance with IRS statutes. To make the tax process as convenient and pain-free as possible, we offer our clients 24/7 access to all of their tax information via a secure portal on our web site. 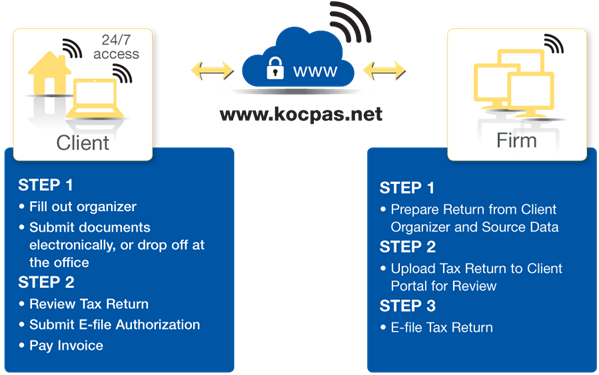 Login any time to review the documents electronically.